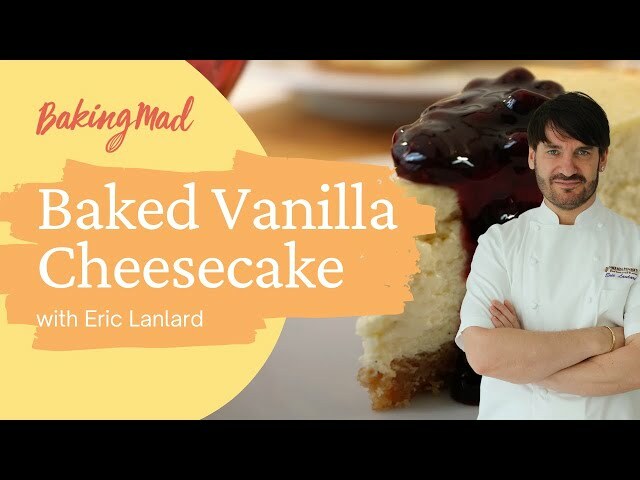 This simple but delicious baked cheesecake recipe created by Eric Lanlard is the perfect way to end any dinner party. If you want to make it even more special, Eric’s top tips to 'jazz it up' are: - Serve with a chunky fresh blueberry compote with crème de cassis. - Sprinkle chopped chunks of toffee fudge and drizzle a salted caramel sauce. Preheat the oven to 180°C (fan 160°C, gas mark 4). Grease and line the base of a 20cm spring form cake tin. Melt the butter and add the biscuit crumbs, stir to combine. Place in the base of the cake tin and spread in an even layer, then flatten (using a spoon). Bake in the oven for 10 minutes until golden. Remove and leave to cool while you prepare the filling. Reduce the oven to 160°C (fan 140°C, gas mark 2). In a large bowl, beat together the cream cheese and golden caster sugar until smooth, then add the sour cream and flour and beat again. Gradually add the eggs and Nielsen-Massey Vanilla Bean Paste, beating well between each addition. Pour the cream cheese mix on to the biscuit base then bake in the oven for 45 minutes. The cheesecake should be just set with a slight wobble and should still have cream on top with just a slight golden hint around the edges. Once the cheesecake is cooked, turn off the oven and prop open the door so that it is slightly ajar and leave the cheesecake to cool in the oven – this prevents the top from cracking. Once the oven is cool you can remove the cheesecake to cool completely before removing from the tin. For the finishing touch, serve with a scoop of homemade Vanilla Ice Cream. Like vanilla extract, this product is made using the whole vanilla pod. A sugar syrup base (rather than alcohol) gives the product a thicker consistency which allows you to add more delicious vanilla flavour without thinning batters or sauces. Nielsen-Massey vanilla bean paste has a delicious aroma and taste and includes seeds so is an ideal substitute for vanilla pods in recipes, such as crème brûlée and ice cream, where you want to add the enticing visual flecks of vanilla seeds without the time or effort of using a vanilla pod. Vanilla bean paste can be used as a direct substitute for vanilla extract or vanilla pods: 1 tsp bean paste = 1 tsp extract = 1 vanilla pod Our favourite is the Nielsen-Massey Madagascan Bean Paste.